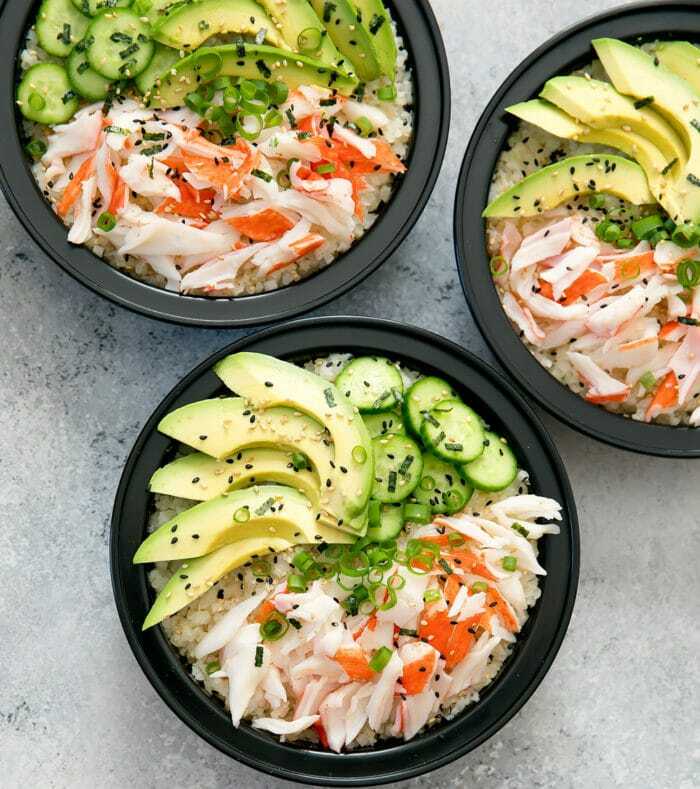 Deconstructed California sushi rolls are served with low carb cauliflower sushi rice for an easy meal that can be prepared ahead of time for your weekly meal prep. California sushi rolls may not be authentic Japanese sushi, but they are delicious. I love the simple combination of crab, avocado and cucumbers. 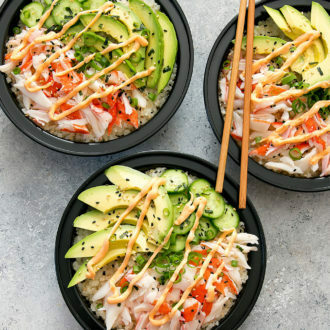 They also taste great in sushi rice bowl form. You get all the flavors of the roll without having to deal with making them into sushi rolls (which can get messy and time consuming). However sushi bowls tend to have a lot of rice, which can get heavy. So I decided to use cauliflower rice instead. I prepared the cauliflower rice in a similar way to sushi rice, seasoning it with seasoned rice vinegar so that it tastes similar to sushi rice. This made for an easy and light meal. And it is perfect for meal prep since there is no raw fish or rice. The imitation crab meat is made of cooked fish. 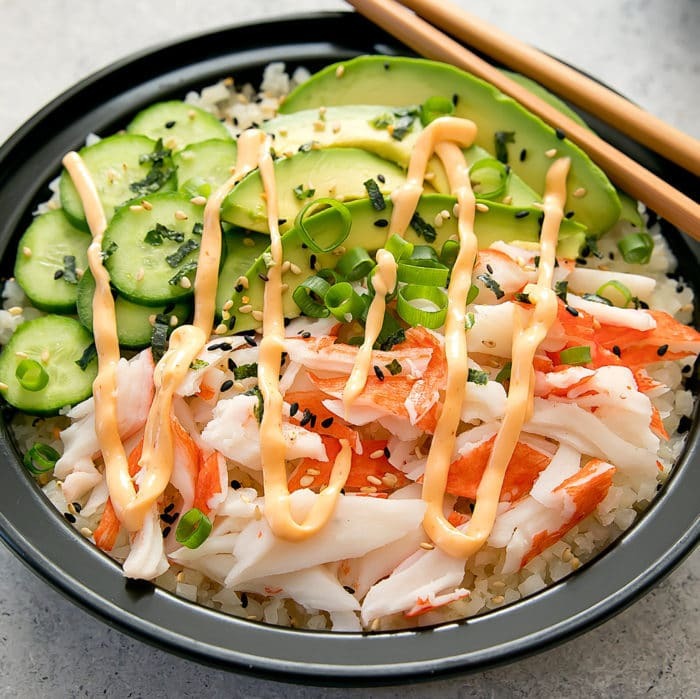 Sushi rice usually needs to be consumed right away as it does not store or reheat well, but cauliflower rice tastes just as good the next day. Make sure to use seasoned rice vinegar and not regular rice vinegar. Seasoned rice vinegar is less acidic and sweeter than regular rice vinegar and is used to make sushi rice. The black and white sesame seeds add different flavors to the bowl, so I definitely recommend adding both. 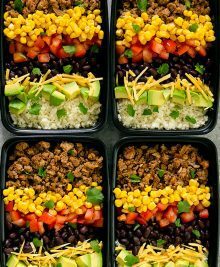 Looking for more easy meal prep recipes? You can view my entire meal prep recipe collection here. 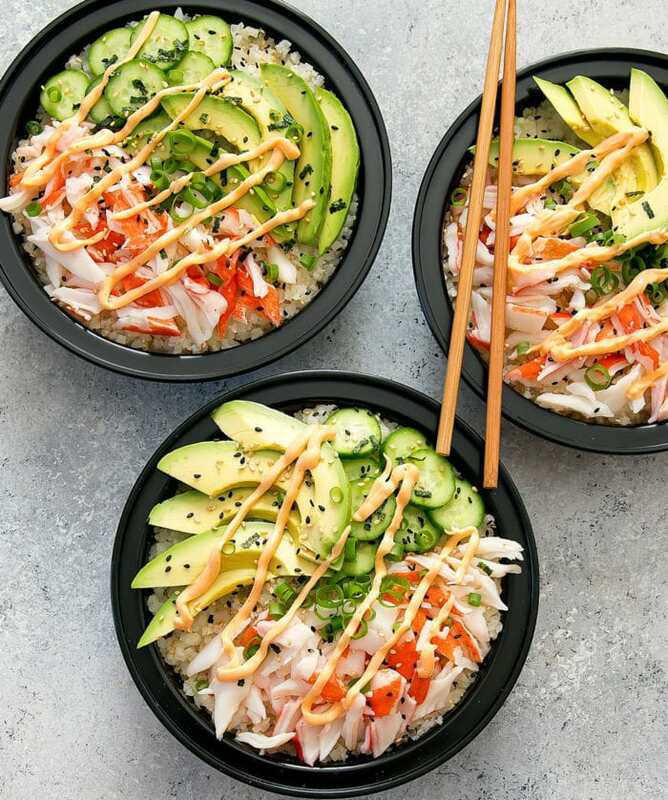 Deconstructed California sushi roll is served with cauliflower sushi rice for an easy meal that can be used for weekly meal prep. In a small bowl, mix mayonnaise and sriracha sauce until evenly mixed. Set aside. Steam cauliflower rice until tender. While rice is still hot, drizzle with rice vinegar and mix vinegar into the rice. Taste and add more vinegar if needed. Add 3 ounces of crab meat to each bowl. Divide cucumbers and avocados evenly amongst the bowls. Garnish with black and white sesame seeds. Garnish with scallions. Drizzle with sriracha sauce. Keep bowls stored in the fridge for up to 3 days. Right before eating, add shredded nori to bowl. You do not want to add the nori ahead of time because it will soften almost immediately. Do you eat this cold? Also, won’t the avocados turn brown if prepped ahead of them? yes this is meant to be eaten cold. If you keep the containers sealed, the avocados should not brown that much. But if you are worried about that being an issue, you can always add the avocados on the day you are going to eat the bowl. 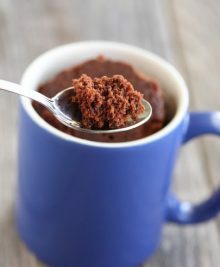 Thank you so much for this recipe, it is excellent! I am a fan of the California Sushi rolls from my local grocery store and this recipe tastes exactly like those. I love that I know exactly what’s in the bowls, that I can make them ahead of time, and that they are healthier because of the cauliflower rice! I’m excited to try this thanks! I made this and it was so good! I have made this 3 times in 2 weeks, and now I’m passing this recipe to my daughter. I have sushi parties once in awhile, I will test this to see if anyone notices. Wow, so happy you liked this recipe so much! Now I’m totally craving a bowl. haha! Should I store in freezer or fridge? Could I add steamed shrimp to this recipe?